Can you believe it? We are just weeks away from the fresh, brisk air of fall. With the incoming season change comes one of the most popular times of the year — apple picking season! 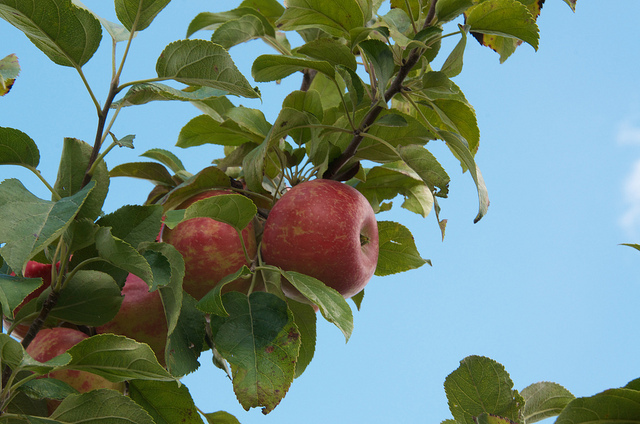 We’ve rounded up some of the most popular apple orchard across the state of Minnesota. If you’re planning a fall RV trip through the state, be sure to stop by one of the farms to pick some crispy, sweet Minnesota apples. Minnesota Harvest Apple Orchard sits along the aptly named Apple Lover’s Lane. This family farm, open since 1971, hosts a yearly calendar of family friendly events, but it’s their fall harvest season that makes us come back again and again. This year’s apple picking season opened on August 15th and is expected to continue until November. If you’re heading to the farm, call ahead first to find out about the day’s harvest. The farm is open year-round too, so if your trip through Minnesota falls outside of apple picking season a detour to the farm can still be a part of your plans. In Stillwater, you’ll find Aamodt’s Apple Farm. A popular spot for fall activities, the farm is host to weekly events including tractor rides and a treasure hunt. Apple picking season has started, but it’s expected peak picking days will be in September. With a harvest of Minnesota varieties, like Honeycrisp and Sweet RiverBelle, Aamodt’s Apple Farm is a sweet addition to your Minnesota RV adventure. Just don’t forget to stop into their shop where you can buy some delicious apple syrup and Aamodt’s famous apple bratwurst. Stonegate Orchard near Slayton is family farm with local charm. Visit the orchard for u-pick apples and to make a stop in their store for delicious jams and pies. A local favorite, spending a fall afternoon apple picking at Stonegate Orchard is always relaxing and well worth the detour. Ready to head out on your apple picking adventure? Visit us today! We’ve got the perfect RV for your family’s vacation plans and our experienced staff is always ready to show your around the newest arrivals.